[Episcopal Church Office of Public Affairs] Presiding Bishop Michael Curry announced July 25 that he will soon undergo surgery for prostate cancer. I’ve been told that 4-6 weeks is a reasonable time to anticipate. I plan to resume my duties in early September and I do not anticipate any significant changes in my commitments. I am very blessed with a wonderful family, a first-rate medical team, a great staff, dear colleagues and friends, a calling to which I have given my life, and above all a good, great and loving God in whose hands we always remain. So, do say a prayer. And know that I look forward to being back at my post in September. Our prayers will be with you during your surgery and recovery. We love you, Bishop Curry! All will be well. We love you, Michael. You have our every prayer for a speedy recovery. Heal him and hold him in the palms of your ever loving hands , Dear God . Please be sure of my prayers for you as you undergo this surgery and recovery time! Praying for you Bishop Curry, along with my grandmother, a priest in your former Diocese of NC, who is also battling cancer. Our Dear Bishop, the entire Church World Service family will be upholding you and your family on prayer. To God be the Glory. You, your family,and the medical staff caring for you will be in my prayers for a successful surgery and a speedy recovery. Prayers for you and your family … this is a family “walk” … you have great people walking with you! Praying for a positive result, a trouble-free recovery, and your voice of leadership and prophetic witness at full strength as soon as possible! Prayers of healing love enfold you. May you rest in God’s care and the love of all of us. So very grateful for you. You are in my daily prayers already, Bishop Curry! SO SORRY to hear this but am resting “our guy” into THEE HANDS of the GREAT PHYSICIAN. We will be praying for you dear friend & leader ! A symphony of prayers will be offered for a successful surgery and for your continued healing!!! My wife and I are praying for you Bishop Curry! We pray also for your family and all the medical team who will provide you treatment and care. 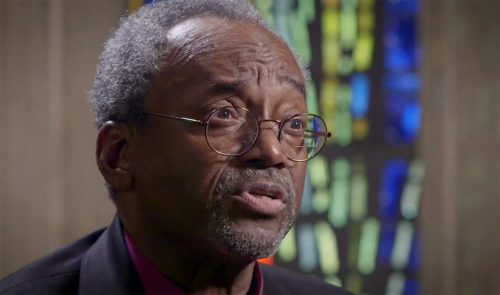 God, take this cancer from Bishop Curry’s body and restore him to full health. Amen! Amen! Amen! The Brotherhood of Saint Gregory holds you close in our prayers. All will be well, and all will be very well, and all manner of things shall be well! God bless and keep you, dear Bishop Michael! Dear Michael, You are in good hands with our God. We wish you a speedy recovery. May our Holy Lord continue to walk with you especially at this time. May He grant your family His Strength and Solace. Blessings. Yes, I will pray that your surgery goes well and that you heal quickly! Had the same surgery 14 years ago. No further problems. Just follow your surgeon’s instructions and all will be fine. There will an uncomfortable, but necessary, “attachment” for about ten days. When that is removed will be a great day. Prayers. Prayers from the Monroe, Louisiana twig of the Jesus Movement! ¡Oraciones de la rama del Movimiento de Jesús en Monroe, Louisiana! Yes, Imwill pray that your surgery goes well and that you recover quickly! Please know that the Daughters of The King, St. Mary’s Chapter, Daytona Beach, FL will be praying for you to come through the surgery comfortably and have a speedy recovery! You will be in my prayers. May God continue to bless and keep you. Peace.